Enterprise Only: Disaster Recovery Replication is a part of Vault Enterprise Pro. 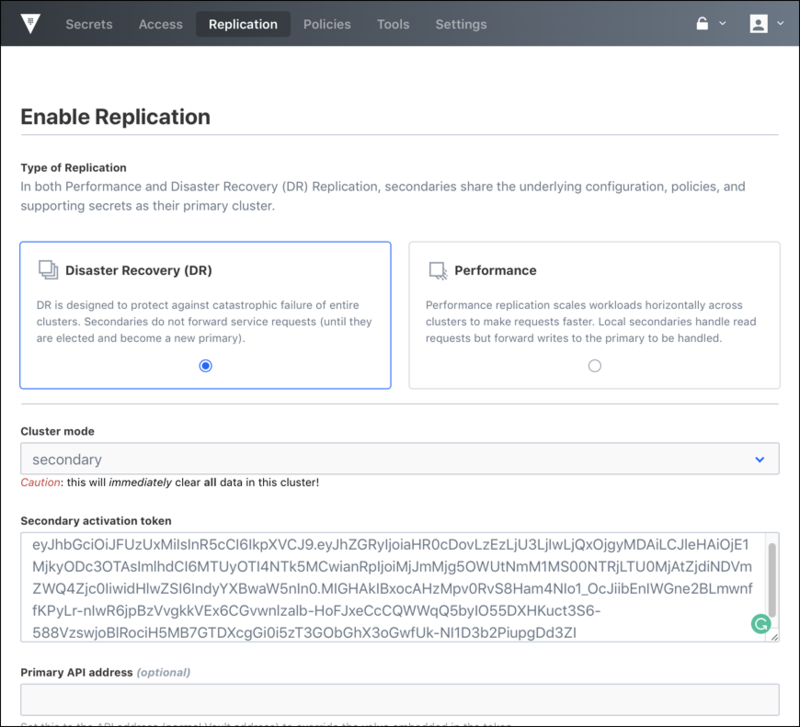 It is inevitable for organizations to have a disaster recovery (DR) strategy to protect their Vault deployment against catastrophic failure of an entire cluster. Vault Enterprise supports multi-datacenter deployment where you can replicate data across datacenters for performance as well as disaster recovery. A cluster is the basic unit of Vault Enterprise replication which follows the leader-follower model. A leader cluster is referred to as the primary cluster and is considered the system of record. Data is streamed from the primary cluster to all secondary (follower) clusters. Important: In DR replication, secondary clusters do not forward service read or write requests until they are promoted and become a new primary. They essentially act as a warm standby cluster. The Mount Filter guide provides step-by-step instructions on setting up performance replication. This guide focuses on DR replication setup. You need two Vault Enterprise clusters: one behaves as the primary cluster, and another becomes the secondary. 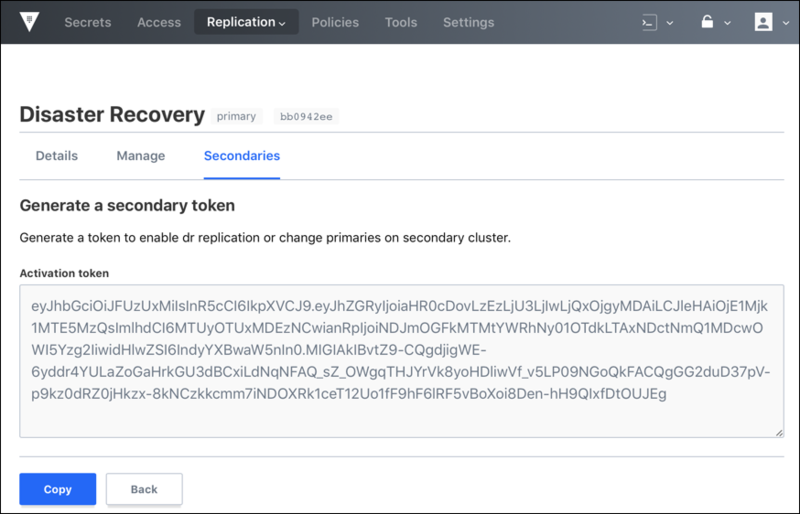 Enable DR replication on the primary cluster. $ vault write sys/replication/dr/primary/secondary-token id="secondary"
Copy the generated wrapping_token which you will need to enable the DR secondary cluster. Enable DR replication on the primary cluster by invoking /sys/replication/dr/primary/enable endpoint. unavailable for a brief period and will resume service shortly." Generate a secondary token by invoking /sys/replication/dr/primary/secondary-token endpoint. Copy the generated token which you will need to enable the DR secondary cluster. Open a web browser and launch the Vault UI (e.g. https://cluster-A.example.com:8200/ui) and then login. Select the Disaster Recovery (DR) radio button. Populate the Secondary ID field, and click Generate token. 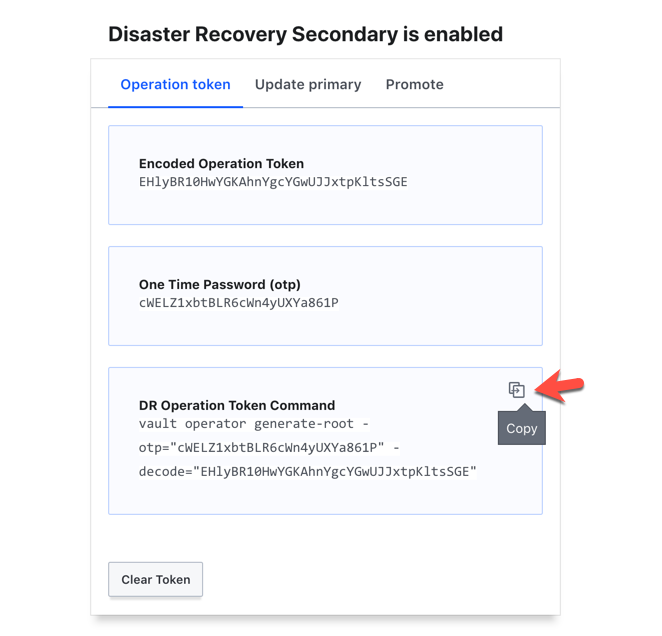 Click Copy to copy the token which you will need to enable the DR secondary cluster. The following operations must be performed on the DR secondary cluster. 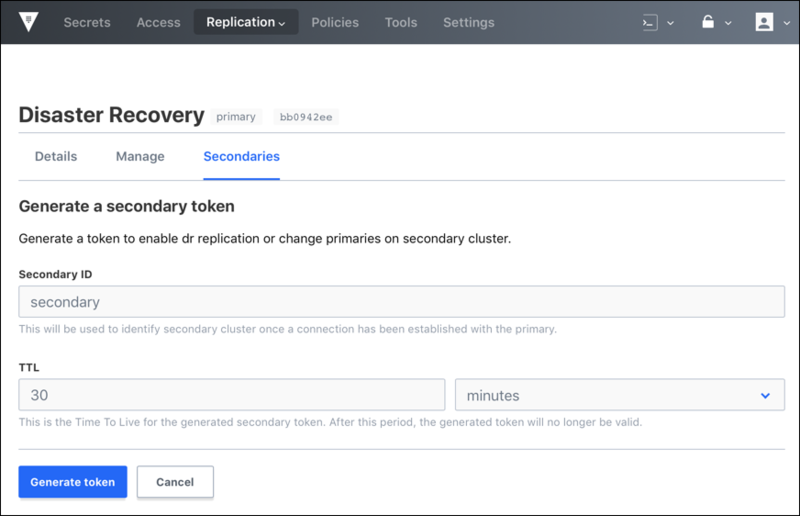 Enable DR replication on the secondary cluster. $ vault write sys/replication/dr/secondary/enable token="..."
Warning: This will immediately clear all data in the secondary cluster. Now, launch the Vault UI for the secondary cluster (e.g. https://cluster-B.example.com:8200/ui). 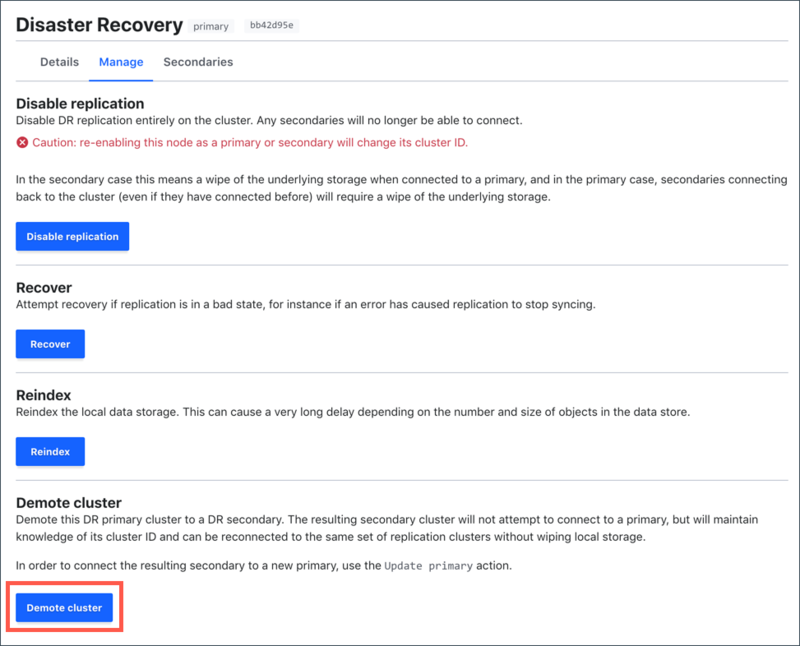 Check the Disaster Recovery (DR) radio button and select secondary under the Cluster mode. Paste the token you copied from the primary in the Secondary activation token field. 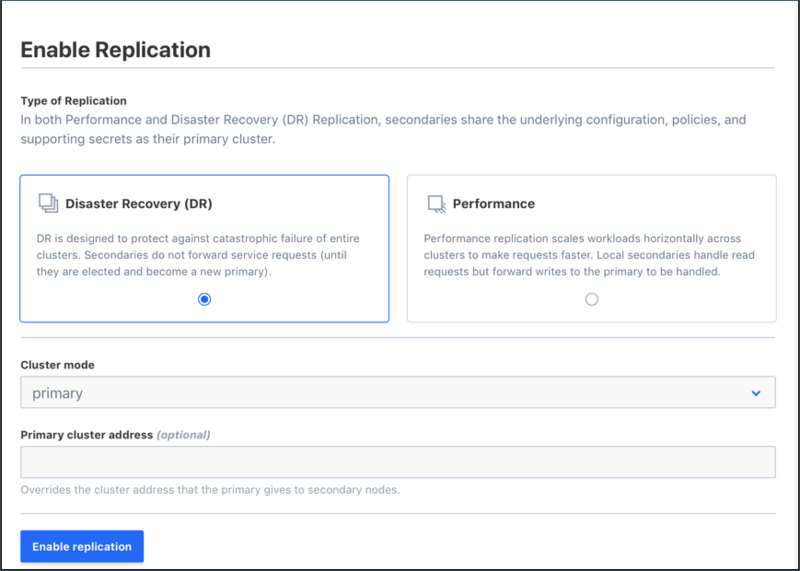 This step walks you through the promotion of the secondary cluster to become the new primary when a catastrophic failure causes the primary cluster to be inoperable. Refer to the Important Note about Automated DR Failover section for more background information. First, you must generate a DR operation token which you need to promote the secondary cluster. The process, outlined below using API calls, is the similar to Generating a Root Token (via CLI). Start the DR operation token generation process. A One-Time-Password has been generated for you and is shown in the OTP field. You will need this value to decode the resulting root token, so keep it safe. Distribute the generated nonce to each unseal key holder. In order to generate a DR operation token, the following operation must be executed by each unseal key holder. Once the threshold has been reached, the output will contain the encoded DR operation token. Decode the generated DR operation token (Encoded Token). Finally, promote the DR secondary to become the primary. The request must pass the DR operation token. Click on Generate Operation Token. A quorum of unseal keys must be entered to create a new operation token for the DR secondary. This operation must be performed by each unseal-key holder. Once the threshold has been reached, the output displays the encoded DR operation token. Click the Copy icon. Execute the copied CLI command from a terminal to generate a DR operation token. Now, click Promote tab, and then enter the generated DR operation token. When you prompted, "Are you sure you want to promote this cluster? ", click Promote cluster again to complete. Once the secondary cluster was successfully promoted, you should be able to log in using the original primary cluster's root token or via configured authentication method. If desired, generate a new root token. If the original DR primary cluster becomes operational again, you may want to utilize the cluster by making it a DR secondary cluster. This step explains how to demote the original DR primary cluster to a secondary. Remember that there is only one primary cluster available to the clients in DR replication. Execute the following command to demote the original DR primary cluster to a secondary. This secondary cluster will not attempt to connect to a primary (see the update-primary call), but will maintain knowledge of its cluster ID and can be reconnected to the same DR replication set without wiping local storage. Invoke the sys/replication/dr/secondary/enable endpoint to demote the original DR primary cluster to a secondary. "This cluster is being demoted to a replication secondary. Vault will be unavailable for a brief period and will resume service shortly." Select the arrow next to Status and click Primary under REPLICATION. When you prompted, "Are you sure you want to demote this cluster? ", click Demote cluster again to complete. 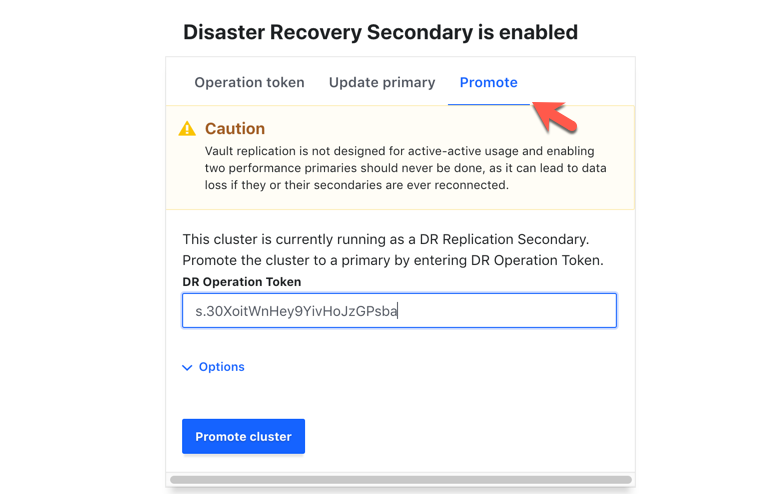 Once the DR secondary cluster was promoted to be the new primary, you may want to disable the DR replication on the original primary when it becomes operational again. Execute the following command to disable DR replication. a brief period and will resume service shortly. Any secondaries will no longer be able to connect. Invoke the sys/replication/dr/primary/disable endpoint to disable DR replication. "This cluster is having replication disabled. Vault will be unavailable for a brief period and will resume service shortly." Select Replication and click Disable replication. When you prompted, "Are you sure you want to disable replication on this cluster? ", click Disable again to complete. Caution: Once this is done, re-enabling the DR replication as a primary will change the cluster's ID. Its connecting secondaries will require a wipe of the underlying storage even if they have connected before. If re-enabling DR replication as a secondary, its underlying storage will be wiped when connected to a primary. Vault does not support an automatic failover/promotion of a DR secondary cluster, and this is a deliberate choice due to the difficulty in accurately evaluating why a failover should or shouldn't happen. For example, imagine a DR secondary loses its connection to the primary. Is it because the primary is down, or is it because networking between the two has failed? If the DR secondary promotes itself and clients start connecting to it, you now have two active clusters whose data sets will immediately start diverging. There's no way to understand simply from one perspective or the other which one of them is right.